You don’t need to have a degree in project management to get your marketing done, but I bet you occasionally wish you had a time machine. Unfortunately, Time Lords are imaginary and the Tardis doesn’t exist. You can’t press pause whilst you write a blog post, or go back in time to get it all done. If you’re serious about making time for marketing, it’s time to stop the sci-fi fantasies and get practical about things that really make a difference. This means applying some basic principles to the value of your time. Have you ever seen the ‘big rocks first‘ trick? This is where you can fit more in your metaphorical jar, because you get the big stuff done first, and then fit the little jobs in the ‘spaces in between’. For marketing, this means choosing a set of marketing big rocks… key things you commit to doing. Ideally, one for each of the six tasks of marketing! (See: Watertight Marketing, Chapter 1). At the start of a project I like to ask ‘so, how do you want to do this? Some people like to roll their sleeves up, others step away completely. There’s pros and cons to each – do more yourself without incurring the cost, or pay someone else to do it. This can be a cost issue, but Rachael Wheatley’s post ‘When to outsource your marketing’ will give you some help on weighing this up. But, just as important here is knowing whether you want to roll those sleeves up, or you’d rather someone else just got on with it. So, are you a ‘sleeves rolled-up’ or ‘please, just get on with it’ person? Ok, so let’s say you have the skill and you want to do it yourself. If marketing isn’t your only role, it’s not unusual to find it pushed to the back of the queue (paying work first right)? You’re also not alone if you find yourself doing it in unsociable hours and at weekends too. Marketing your own business can be a massive muncher of your downtime. So what can be done? I’m going to share some tips later, where if you can add a bit more structure to your working week (and stick to it) you will create time. Some great tips on getting diaries organised later. If this is how you feel, the time crunch comes from not giving the process of delegation the time it needs to stop the task bouncing back on you. If you delegate to others (your team or third parties), you still need to give them your time. If you don’t, you will waste time (yours and theirs, and with it your money in the form of what you’ve paid them, the rework costs and the opportunity costs of the time it stole). You really need to find time to brief people properly, review their output, and adhere to agreed actions and sign-off days. Otherwise you might not get what you want and you’ll have to do it all again. See: Our guest post from Karen Meager on How to make time for marketing when you run your own business. Plan ahead – Because default diaries organise time. Be brave – Because swift decision making saves time. Be clear – Because not being clear costs you time and money. Get organised – Because To Do lists prioritise time. Delegate – Because getting some help frees up time. Tackle your procrastination – Because delaying things eats up time. Make technology your friend – Because it really does create time. At the risk of writing a lengthy article that will take loads of you time to read [ha ha], I’m going to focus only on the first three tips here. ‘You can’t fit a pint in a half pint pot’, which essentially means there’s only 24 hours in a day and you need to sleep, rest and play for some of them. Even if you still swear by the Filofax, your diary is absolutely your best friend. Use it well and block out time each week to get things done. I use iCal for Mac and it’s synced across multiple devices. You can ‘subscribe’ to other people’s calendars too and turn them on and off for a quick snap shot of work streams (or work vs personal stuff). I’m a big fan of colour-coding which makes it really easy to see what I’m doing each day/week – red for meetings with travel, yellow for phone calls, green for deadlines for example. I even put notes, reminders and deadlines in my calendar with alerts to keep on top of things. I also block out ‘default’ time on the same day each week for recurring tasks. This gives me rhythm. I also mark that time as ‘busy’ so people can’t add things in (and I really do say wherever possible ‘sorry, I’m not available at that time’). They always come back with an alternative slot. Another big tip is to add time either side of entries for travelling, prep and/or follow-up, (or even just to have a break). Forgetting about the time you need either side of things leaves you in a rush. Think of it as a contingency. How could you organise your diary to get the most fro the way you work? Learn to be fast and confident with decision-making because procrastination eats up time. I’ve seen gallons of time wasted because a decision has not been made. I’ve even seen days wiped off schedules because sign-offs or approvals just didn’t happen. Say yes (or no) quickly and save hours, days and sometimes weeks. So what stops people being brave in their marketing decisions? Not having a framework within which to set the decision. Not knowing the best order in which to sequence all their activities. Worrying that their work won’t be perfect, novel or interesting enough. The framework piece is a big one for us. 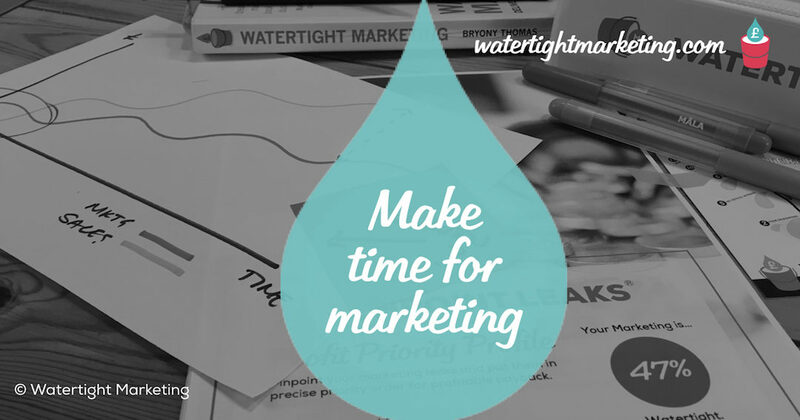 Watertight Marketing is essentially a series of interlinked tools or lenses into which you lay your thinking to quickly see how it all fits together. Because it’s highly visual, once you’ve mastered it you can run it quickly in your mind’s eye whenever there’s a marketing decision to me made. Sequencing is quite possibly one of my top skills. Years of preparing timelines and Gantt charts for complex design and events projects means that I can quickly tot up tasks and dependencies. There are lots of great tools like Basecamp and Trello that can help you with this… or of course, a good old-fashioned pack of post-its and a wall. Put every task that needs doing on a separate post it note and then put them on a wall in the order they need to be done. Oh, and if you’ve done a Touchpoint Leak™ Assessment, you should always know what your top marketing leak is! See: What are the Thirteen Touchpoint Leaks? Oh, and perfection?! Well, we all know that’s over-rated. You’ll often hear Bryony Thomas advise clients to aim for “functional and not embarrassing.” Seriously, 60% and published is sooooo much better than 100% and in your drafts folder. You’re almost certainly your own harshest critic. If you’d give your stuff a 6/10, publish it. You can come back to polish it later if it starts to gain traction. One of my favourite quotes is… “If you cannot say what you mean, you will never mean what you say.” as spoken by Peter O’Toole in the film The Last Emperor. He was basically saying that if you can’t articulate what you want, you may be misunderstood. We all know that it can take time (and money) to remedy misunderstandings. Whether doing something yourself or outsourcing, be clear on requirements and deadlines. Give more rather than less detail because people would rather pick-out what they need than guess or assume (more room for misunderstandings). A clear brief will avoid questions later because they are already answered in the brief (more time saved). Also agree what’s in scope (as well what isn’t) to avoid disappointment later. I’ve heard of situations where someone hasn’t read the brief (because they are too busy), and have said ‘just get on with it’. When the work turned up, it wasn’t what they expected (they’d been misunderstood), even though it was clearly in the brief (that they hadn’t read). Now the work had to be done again which cost everybody time and money. If you’re delegating a task, always have someone talk you through their understanding of a task before they do it. So, the moral of the story is – being busy, making assumptions and not making time to read things could cost you time and money. If you get into a rhythm and get over the initial hump of learning new things and new habits, marketing is like exercise… it’s addictive. You can really start to enjoy your marketing – done properly it will get you long-term sales results. And with a few tweaks here and there to how you go about getting it done, maybe you can become a Time Lord after all. 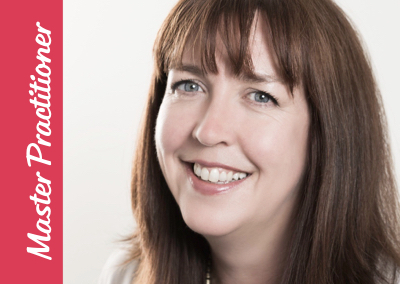 Cheryl is a highly experienced marketing project manager who’s delivered for the country’s most demanding brands. She’s a high-energy individual, whose passion is for owner-managed businesses where she can make the biggest difference.